Nothing much can be said about this MS Word recovery software, except exceptional. There are many tools available in the market, but this has got something extra. Its interface is superb and can be the best option for dealing with corrupt DOC file. I am just too impressed with the software performance. The tool was very easy to operate and helped me restore the corrupt MS Word file in just a few minutes. This software has certainly saved the day and I am glad having this product. I also work in the IT industry and this smart tool is unlike any other tool I’ve ever came to know about. It is too easy to operate and has got some of the most remarkable features that you may not be able to find in any other software. Well done! 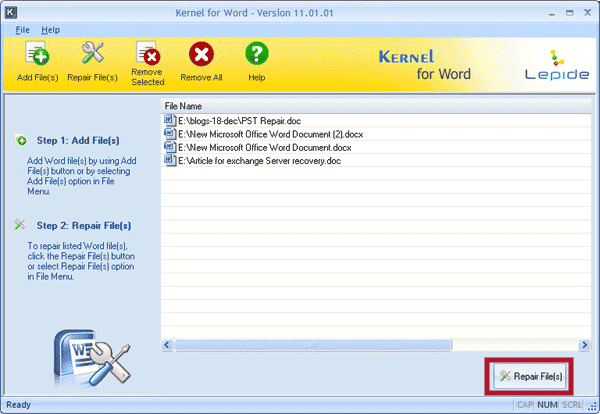 Kernel for Word Repair is a proficient tool that helps users repair and recover corrupt/damaged Word file documents. It works for every version of MS Word, including MS Office 2019, 2016, 2013, 2010, 2007, 2003, 2002, 2000, and 97. You can download the trial version of this tool, which can be used to fix corruption/errors of Word files. Are you unable to repair Word documents? What Can You Recover with Kernel Word Repair? With Kernel Word Repair software, users can quickly recover inaccessible data from corrupt Word files. Following are the elements that can be recovered be Kernel Word Repair tool. 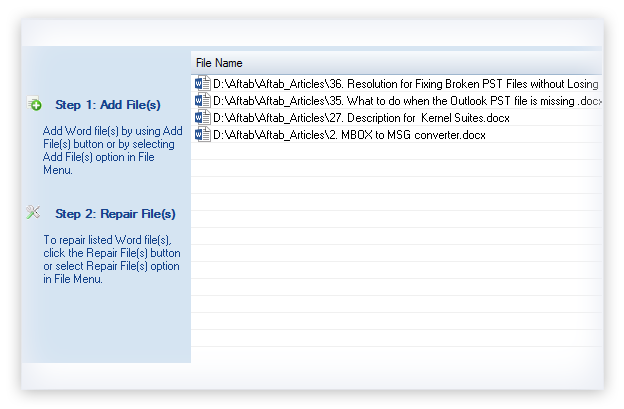 This MS Word repair tool is a complete package to fix MS Word file opening errors and issues. Irrespective of the intensity and complexity of the damage, it repairs corrupt Word files effectively. It repairs corrupt Word files, and retrieves the original MS Word text, fonts, graphics, UNICODE characters, hyperlinks, graphs, tables, structure, properties, formats, forms, and headers/footers of the documents. The tool repairs many inaccessible Word documents in bulk, irrespective of their sizes and intensity of corruption. In that case also, Word recovery is quick, precise, and complete. 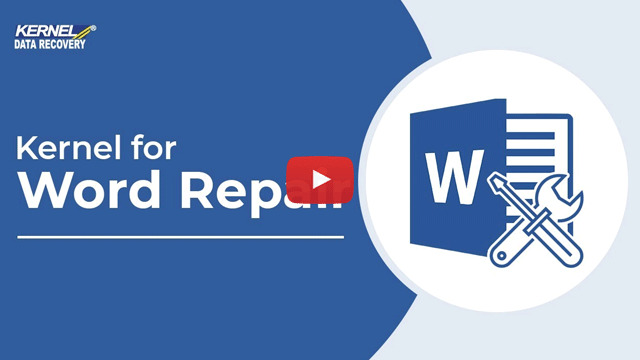 This Microsoft Word repair tool extracts information from small as well as oversized word documents. Also, this tools fixes issues with Word files having very large names. This Word file repair tool supports formats like .doc, .dot, .docx, .docm, .dotx, and .dotm. Simply, you can use this tool with Word documents of 97-2003 format/templates, XML enabled documents/templates, and Macro enabled documents/templates. Repairing corrupt Word document is easy with this tool as it has a user-friendly design. User can make use of its features without any additional assistance or training. After recovery, the tool displays a link to the Word file saving location so that user can easily open and access the Word files. Kernel for Word Repair software provides its user with a most effective solution to deal with almost all sorts of MS Word file corruption in a very effective manner. SelectIn this step, you would require to make selection of the affected DOC files that you want to restore. BrowseAfter starting the repair procedure, in this step you would provide the respective location to save the repaired file. SaveIn this step, the corrupt DOC file gets restored and saved at the defined location successfully. How to repair Word documents with this software? Launch Kernel for Word Repair tool. Click on Add file(s) button, and Open Word files that you want to repair. Click Repair File (s) button and initiate the repair process. Finally, browse for a destination folder to save the repaired file(s). While trying to open my Word document, I am getting a message ‘Microsoft Office Word has stopped working. A problem caused the program to stop working correctly. Windows will close the program and notify if a solution is available.’ What to do? MS Word displays such error messages when Word documents are corrupt. 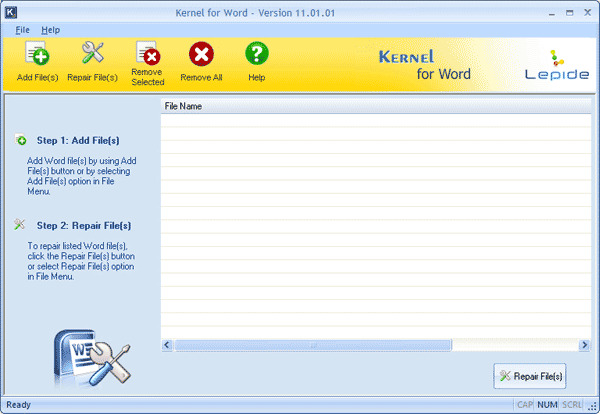 You need to use a good Word recovery tool like Kernel for Word to repair the corrupt documents. I am not able to access my Macro enabled Word documents. Can I use Kernel for Word to recover these documents? 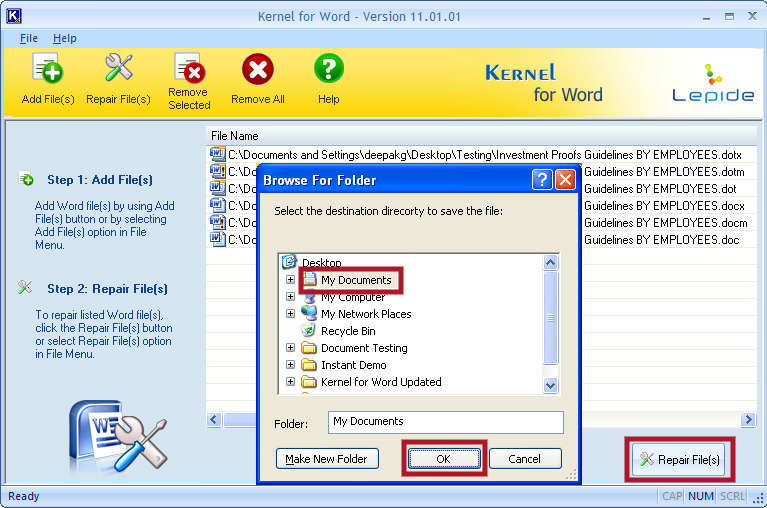 Yes, Kernel for Word Repair supports recovery from Macro enabled Word documents (.docm file format) and Macro enabled Word templates (.dotm file format). So you can use this tool to recovery your documents. Is it possible to open Word file when it is used by the Word repairing software? 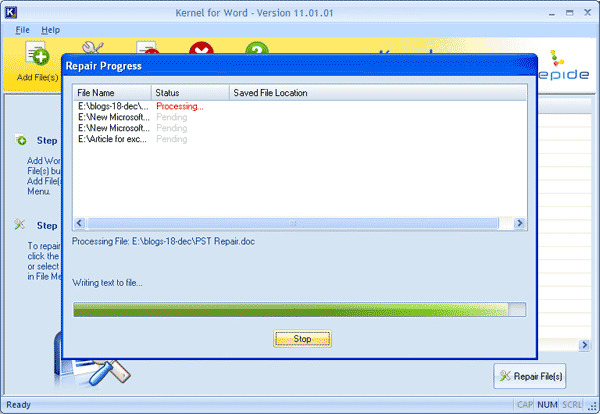 No, you cannot open or access MS Word when the repairing of Word file is in-process with the help of Kernel for Word Repair tool. Can I recover Word file data in its original structure with this software? Fortunately, this software is programmed using advanced algorithms that work efficiently to preserve the original hierarchy keeping all the properties of the document intact along with its attributes. Can this software is competent in restoring the original MS Word files? Yes, the software is very much effective in restoring the damaged file without causing any trouble. In fact, the software recovers your corrupt or damaged Word files without changing their original text, font size, font color, font, embedded images, hyperlink, headers/footers, along with various other attributes of MS Word file. I’m continuously getting an error “Word is unable to read this document”. Do you think it is due to corruption, if yes, suggest a possible solution to repair the Word file? Hello mate, yes, the error you are facing is due to corrupt Word file. You can resolve the issue with the help of Kernel Data Recovery. How would I trace my recovered .doc/.docx file upon recovery? 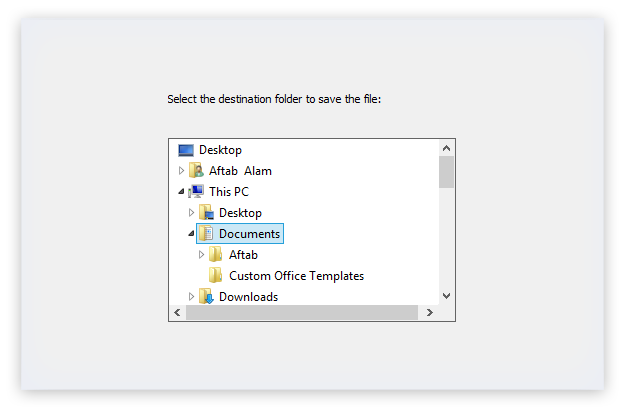 This tool repairs word document and creates a separate folder REC at the user specified destination to restore it. Upon successful recovery, the software displays a link to this location. User can follow this link to open and view the Word files. Select the location for restoring the repaired files. 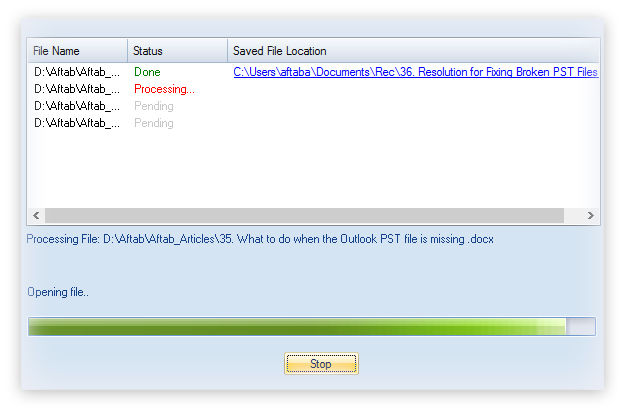 The tool displays the ongoing .doc/.docx file recovery process. 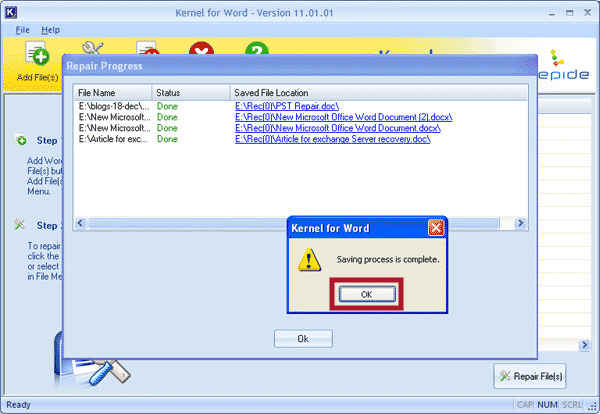 Kernel for Word displays a successful process completion message after the completion of repair process, along with status of files and their saving location. 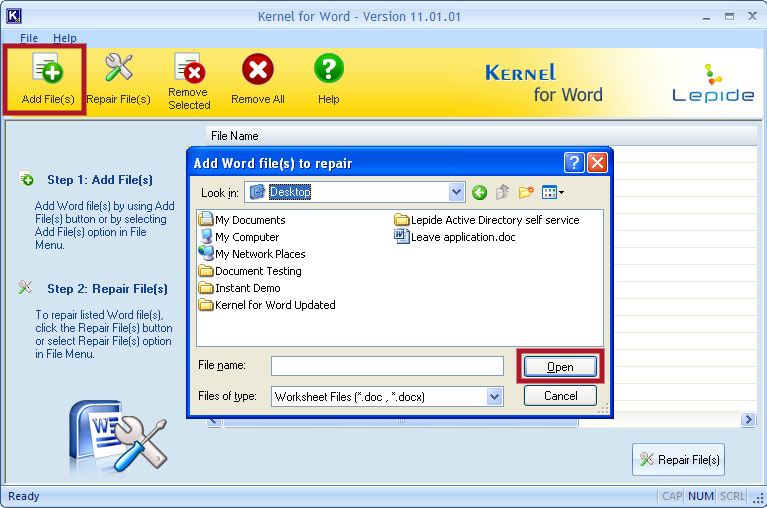 Updated version of Kernel for Word repair has been launched today. The upgraded version (11.01.01) of Kernel for Word is equipped with latest functionality so as to ascertain accurate results. Software is available with the free evaluation version for the users to get familiar with the improved features. Repair corrupt/damaged Excel files instantly with complete data integrity.